Product prices and availability are accurate as of 2019-04-21 23:21:27 UTC and are subject to change. Any price and availability information displayed on http://www.amazon.com/ at the time of purchase will apply to the purchase of this product. 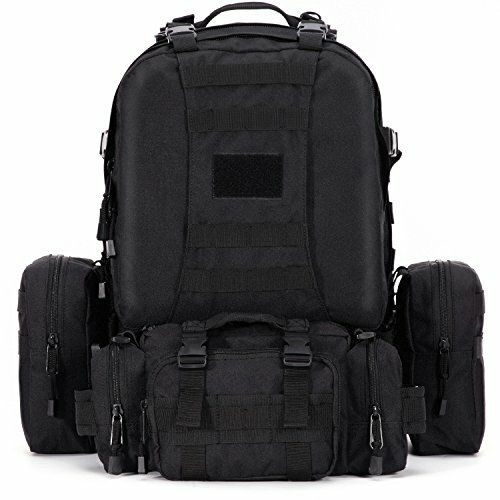 The Gonex tactical backpack crafted from heavy dutywater and tear resistant 900D+PVC oxford. The ergonomic design and well-padded shoulder straps make it comfortable to wear. 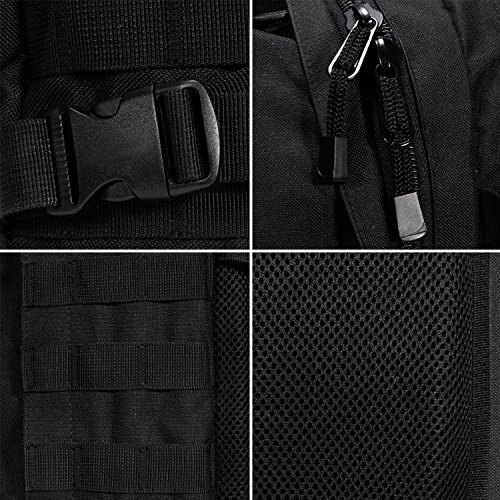 Its MOLLE system is for easy customization, like attaching other bags, water bottles with hooks and such. This bag has the ladder system, which provides multiple points for attaching gear on the rows and columns of the webbing. It is secure to your back with an adjustable chest and waist belt clasp. It is designed with honeycomb air bearing system, which is effectively release the pressure and flow the air. What's more, it has a large capacity with 45L-60L so that you can put whatever you want in it. 1.High Quality Material: made from heavy dutywater and tear resistant 900D+PVC oxford that is lightweight, wear-resisting, chemical resistance, anti-corrosion and environmental friendly. The 900D oxford can obstruct the permeation of water, which is the good accompanist to all kinds of field environment. 2.Modular Design :3 Packs in 1 so you can carry what you need when you need it.The main compartment is 45L that is large enough to organize things well. 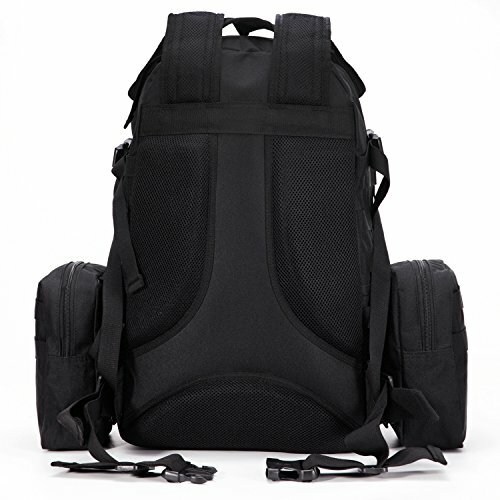 The strong loading systems can extent the bag capacity to 60Lwith two side bags and one waist bag.The small detachable zipper pocket in the waist strap is easy to place some small accessories, such as key, card, gadget, etc. 3.Suspension system: There are loops on top & bottom of this backpack; these can easily accommodate a tent, rolls or sleeping bag, which is a really nice extra. 4.Comfortable travelling: excellent widen shoulder strap, chest strap and waist strap with spongy cushion padding can release the pressure of shoulders. Spongy cushion back padded make it ventilate, your backside feel more desiccative and comfortable. High Quality Material: made from heavy dutywater and tear resistant 900D+PVC oxford that is lightweight, wear-resisting, chemical resistance, anti-corrosion and environmental friendly. The 900D oxford can obstruct the permeation of water, which is the good accompanist to all kinds of field environment. 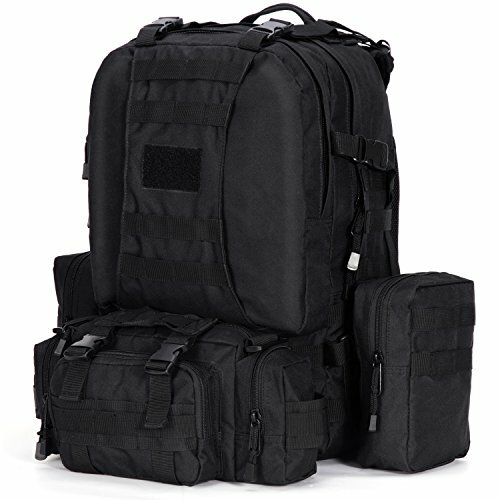 Modular Design :3 Packs in 1 so you can carry what you need when you need it.The main compartment is 45L that is large enough to organize things well. 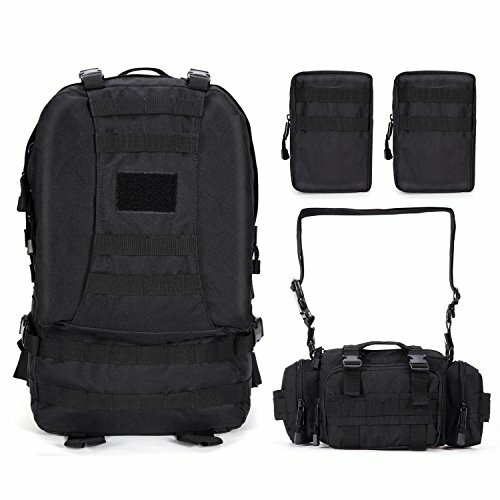 The strong loading systems can extent the bag capacity to 60Lwith two side bags and one waist bag.The small detachable zipper pocket in the waist strap is easy to place some small accessories, such as key, card, gadget, etc. 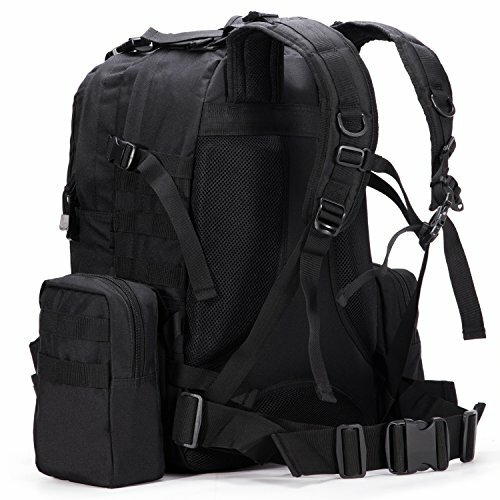 Suspension system: There are loops on top & bottom of this backpack; these can easily accommodate a tent, rolls or sleeping bag, which is a really nice extra. Comfortable travelling: excellent widen shoulder strap, chest strap and waist strap with spongy cushion padding can release the pressure of shoulders. Spongy cushion back padded make it ventilate, your backside feel more desiccative and comfortable. Perfect to use when hiking, traveling, camping, mountaineering and other outdoor activities.